Miss Connor is the lead teacher in Jupiter Class this year. Mrs Chapman is our teaching assistant, she works every morning and on a Thursday afternoon. Mrs Passan works on a Wednesday in Jupiter Class as the lead teacher. There are 29 children in the class, 16 in Year 2 and 13 in Year 3. The final week of the spring term has been a great one in Jupiter Class. In English we shared the fiction text ‘Dragon Stew’. The children worked hard to use adventurous vocabulary to describe the dragon’s physical appearance, along with his interesting personality. We focused a great deal on powerful adjectives and remembered to use commas to separate our adjectives within our phrases and sentences. Once we created a bank of rich and appropriate vocabulary to describe the dragon, the children used their ideas to form sentences and an overall character description. I was extremely impressed with the range of sentence starters and conjunctions used which made the children’s writing even more descriptive! In Maths this week we have been learning about measurement with a particular focus on measuring mass and capacity. We explored how mass measures the weight of solid objects, whilst capacity focuses on the measurement of liquid. To push the children into using higher order thinking skills, we also explored the definitions of capacity, volume and kilo to help them when answering further questions. During our activities the children learnt how to convert between millilitres and litres and grams and kilograms correctly. They also used their understanding of these measurements to estimate what everyday objects would be measured in (kilograms or grams and millilitres and litres). Another key learning point this week was learning how to read scales where some of the increments are missing. We then put this to practise with our baking of oat cakes for our Topic lesson on Thursday! In Science this week the children have identified how fossils are formed from sedimentary rocks. The children identified the five stages of fossil formation and learnt how the cycle takes thousands of years for the sea to recede and the fossils to be revealed. We learnt about the different types of fossils, focusing mainly on trace and chemical. This week the children also completed their KWL grids for everyday materials (Year 2) and Rocks and Soil (Year 3). It was a great opportunity to see everything that they had learnt, demonstrating how their questions from the start of term had been answered. In our Topic session this week the children baked Viking and Anglo-Saxon oat cakes. As previously mentioned, they used their skills learnt in maths to measure the ingredients and read the scales correctly. This practical activity brought our topic to a nice end and I know the children have thoroughly enjoyed learning about the Vikings and Anglo –Saxons this term! This week was brought to a lovely end with our Easter service on Thursday afternoon. The children all did a wonderful job and I was very proud of their poem and prayer performances. Today, we’ve had a well-deserved reward day in celebration of our hard work this term. Hope you all have a wonderful Easter break! Phew! What another busy and super week in Jupiter Class. In English this week the children have moved onto non-fiction texts and identified the features of non-chronological reports. They started the week by planning their initial ideas for their reports before creating a finished piece of writing. The children used their reports as an opportunity to demonstrate how much they have learnt during our Topic of Anglo-Saxons and Vikings this term and I was super impressed with the factual and informative sentences they wrote. They even managed to include stylist devices such as paragraphs and subheadings to enhance their writing. In Maths we have revisited some of our prior learning of place value, addition and subtraction. The children have used their understanding of place value to round 2- digit and 3-digit numbers to the nearest 10 and/or 100 and they all remembered when we round up or down. We have also practised our methods for addition and subtraction this week. Some children focused on written columnar methods, using the expanded or compact method and others chose to use a number line to show their working out. I was very impressed when some of the children managed to exchange tens into ones and hundreds into tens in order to complete the subtraction given. In Science, Year 3 studied the properties of rocks using careful and systematic observations. The children studied each rock and used its properties to describe and classify them appropriately. Before we started our investigations, the class discussed what each word meant and the children used their observations to compare the rocks using water and their physical senses. By the end of the lesson, they had learnt the different vocabulary used, compared different rocks and identified whether they were permeable, durable, dense, hard or soft.Year 2 have also been super busy in Science. They discovered how new materials are invented using regular everyday, natural materials. They studied the work of inventor John McAdam and identified the name of the new process he invented. The children investigated how his work has impacted on life today and in pairs they collaboratively created a fact file about John McAdams’ life using interesting facts about him. In pairs, Year 2 then presented their fact files to the rest of the class, highlighting what they had learnt and found most interesting. The children have also been completing some music lessons with Mrs Passan on a Wednesday afternoon. They have been following rhythms appropriately and used their voices carefully to create the correct tone and pitch. I was very impressed when I popped in to hear the children attempting to sing using a cannon in their song. They have also been practising a French poem over the last few weeks which we will perform after Easter. The children have worked really hard on their pronunciation of the French vocabulary and next week we are going to add in some actions too! In English this week we started the week by writing a book review about Arthur and the Golden rope. The children used their opinions to state what they liked and disliked about the text and created reasons as to why/why not they would recommend the book. I wasn’t surprised when everyone said how much they loved the fiction text; they really have been so engaged with it this term and I have thoroughly enjoyed it! Following on from this the children created their own poems using repetitive language which they then had the opportunity to perform in front of the class. Whilst both classes used expanded noun phrases to describe exactly what they would use their golden rope for, some children went even further and used similes, metaphors and personification! In Maths this week we have continued to explore money. The children have practised adding different amounts to find totals in a range of practical activities, compared different totals and subtracted different amounts in pence and pounds to identify the correct change. The children have been using their understanding that one hundred pennies go into a pound to convert between the two and this has made finding the total amount of change a lot easier. Once the children mastered theses skills they then moved onto solving problems in order to apply their skills learnt. In Science this week, Year 3 have continued to learn about rocks and fossils. On Monday we were lucky enough to have Mrs Hampson watch our lesson and she was so pleased with how much the children had learnt about the different types of rock. The children used their understanding of igneous, sedimentary and metamorphic rock to explain the cycle in detail and they created their own cycles to demonstrate just how much they had learnt and understood. Year 2 have continued to learn about everyday materials and this week they identified materials which are recyclable and non-recyclable. They had to sort the items that they believed could be recycled and then using their knowledge learnt they recreated the cycle that materials go through in order to be recycled properly to help protect our environment. This followed on perfectly to our recyclable monsters that some children created for Red Nose Day last week! In Topic this week the children have learnt about religion during the Anglo-Saxon and Viking times. They learnt how often Anglo-Saxon and Viking people were pagans which meant that they believed in many gods, as opposed to Christianity where there is only one god. Luckily, our text this term has helped us understand the Viking gods in greater depth so the children came into the lesson with lots of prior knowledge. Some children then managed to compare it to their own beliefs! We have had yet another great week in Jupiter class and have thoroughly enjoyed celebrating British Science week at every opportunity! In English, the children have retold the mythical story from Arthur’s point of view. They started by creating a written plan to support their initial ideas and then wrote descriptive sentences using wonderful vocabulary. It was great to hear and see the children using language from the text which really demonstrated that they had read and understood it. Following our theme of ‘Journeys’ for British Science Week, in exciting writing this week the children had to write a narrative about Neil Armstrong’s first steps on the moon. The children used their experiences of the wonderdome last week to support their ideas and combine fiction with non-fiction. In Maths this week the children have developed their expertise with handling and understanding money. We have studied pence and pounds and converted between the two. The children kept reminding themselves that one hundred pennies are in one pound and this made the conversion simpler. Once we were confident identifying pounds and pence the children had an opportunity to find the totals and we even looked at giving the correct change. We also identified how there can be many ways of making up a given value and Year 2 especially worked on this. We will continue this area of measurement next week as well. If you hadn’t guessed it already, this week is British Science week and to celebrate Jupiter class have completed a variety of activities. One of the experiments we completed was making oobleck. This is essentially slime and the children loved getting super messy. However, I wanted the children to really understand the science behind the oobleck and the reasons why it is so fascinating. We learnt how it is a non-Newtonian fluid because its viscosity (thickness) can be changed when a force is applied to it. The children were amazed to see how a fluid could change between being a liquid and a solid so quickly. It was also super easy for the children to make because all we needed was corn flour and water! We also carried out an experiment which tested the flight time of paper aeroplanes. Similar to the oobleck activity, this experiment was suitable because it linked in well to Year 3’s previous Science topic of forces but also the week’s theme of ‘Journeys’. The children created their own planes and using a stopwatch they measured the time it took their plane to drop in comparison to the scrunched up paper. The children learnt that this is a result of the forces generated by air pressing on and moving over the surface of the paper. In Topic this week the children have been identifying how modern day children share similarities and differences with Anglo Saxon/Viking children. Using themselves as a model, they identified key facts about their lives. For example where they go to school, their living arrangements and what they eat. Using research from books and the internet, they then identified these key facts about Anglo Saxon/Viking children and used the information collected to create a comparison. Another super busy week in Jupiter Class this week! In English the children have continued to explore the fiction text ‘Arthur and the golden rope’ and we are still thoroughly enjoying it! This week, the children have stepped into role as Arthur and wrote a diary entry about the series of events that have taken place so far. They used fantastic adverbs and adjectives for extra description and a range of sentence starters to entice the reader in. The children have also developed their understanding of the different word class by identifying nouns, verbs, adverbs and prepositions within a sentence. They then used this understanding to create a description of a setting and we even managed to include similes for extra description! In Maths the children have been learning about statistics this week. They have been interpreting information from tables and constructing simple tally charts/frequency tables. They have explored a range of tables including pictograms, block charts and tally charts. Year 3 thoroughly enjoyed asking Reception children questions to construct their own tally chart at the beginning of the week. Towards the end of the week, the children used their understanding to solve problems involving the range of tables and charts explored in previous lessons. In Science this week, Year 2 have used their understanding of bar charts to make their very own! They used the statistics created from their experiments last week and created a bar graph to show their results. The children enjoyed linking both their Maths and Science learning together and it was certainly clear that they had learnt a lot! Year 3 continued to learn about rocks and soils, specifically focussing on the 3 different types of natural rock this week. We identified how rocks can be classified as man-made or natural but how they can also be grouped further into igneous, sedimentary and metamorphic rocks. The children learnt about the similarities and differences between them and they were amazed to learn how rock is formed both inside and outside the Earth’s surface. In Topic this week the children have continued to learn about Anglo-Saxons and the Vikings. They shared their understandings of settlements as previously explored with Mrs Passan and then the class learnt about Viking place names. We discussed how evidence of the Vikings can be found all around us, from ruins to precious objects, but perhaps most surprisingly in the names of the places we live. In small groups, the children used an atlas to try and locate places which have Viking words in them. They were shocked to learn that there were so many! Thursday and Friday this week have been super exciting in Jupiter Class. On Thursday 7th, Jupiter Class (along with the entire school) dressed up for world book. I was so impressed with the outfits and the children loved parading around the hall and sharing their books with each other. On Friday 8th, we were lucky enough to experience a ‘Wonderdome’. It was amazing and told us so many wonderful facts about Space. Once inside the dome, we learnt all about space travel, the planets and the famous astronauts who have landed on the moon or visited the space station in the past. We left feeling extremely lucky to have seen something so informative and realistic. The first week back after half term has been a busy one! In Maths the children have practised multiplying and dividing numbers, using known facts from their times tables to help them. Whilst some children focused on multiplying 1-digit numbers together and finding related division facts, some children have explored multiplying and dividing two –digit numbers by one digit numbers. The children have used mental and written strategies for these types of questions and all the different approaches have been shared as a whole class. In English this week the children have continued to read and explore ‘Arthur and the Golden Rope’. On Monday the children learnt how Arthur chose to go on his quest to find Thor and they had to discuss and write their opinions about what he should take with him. As we read more of the fiction text, we thought it would be a good idea to predict what we thought might happen next. All the children had wonderful ideas about what they thought Arthur would get up to and they managed to use fantastic adjectives, sentence starters and adverbs! This week the children have also completed some assessments in English and Maths to identify which areas we know really well and the ones we need to learn and practise more. On Tuesday this week, we started our PE sessions with Mrs Wisbey. The children thoroughly enjoyed getting outside in the sunshine and more importantly, practising their racket skills. They developed their ability to throw and catch, before progressing onto using the tennis rackets with control and care in team games scenarios. These sessions will take place every Tuesday afternoon until the Easter break (end of term). In Science this week, Year 2 have continued to explore ‘everyday materials’ by investigating what objects change shape and why. They had to use their understanding of materials to create reasons why a particular object could/couldn’t change shape. Next week to link in with our mathematical topic of statistics, the children will convert their findings onto a bar chart to present their results. This week Year 3 have finalised their learning of forces and magnets and begun investigating their new topic of ‘rocks and soils’. The children discussed what they know already and what they want to know by the end of term to be as successful as possible. This week has gone by in a flash and we have been as busy as ever with the run up to half term. In English we discussed the importance of having our own opinion in relation to a text, whilst also valuing other people’s opinions. As we had learnt previously how Arthur’s Icelandic town had been destroyed by a monstrous wolf, it was up to Jupiter class to discuss reasons for or against Arthur going on a quest to find Thor (the god of the skies). Using evidence from the text, the children came up with brilliant reasons supporting or disagreeing with Arthur’s plan to find Thor and save his Icelandic town. These ideas were then transferred into a formal letter to the Town Mayor to encourage him to listen to their views. Despite some of the children’s best efforts, Arthur did decide to go on his quest and Jupiter Class are all very excited to find out what happens next after half term! In Maths the children have been learning about 2D and 3D shapes. We started the week by really unpicking the vocabulary used to address any misconceptions and to ensure the children fully understand what words mean and how these help us name shapes correctly. The children identified the properties of both 2D and 3D shapes and then used their understanding to reason and problem solve. We discussed the number of faces, edges, vertices and lines of symmetry each shape had and compared their similarities between the two. The children quickly noticed that their understanding of 2D shapes helped them when studying 3D shapes as each individual face is a two dimensional shape. In Science this week we took our learning outside and combined it with Mrs Tickle’s outdoor learning. Year 2 identified how some everyday materials can be manipulated in different ways for particular purposes and this was interesting when watching how fire is created and Year 3 used the different forces of pushing, pulling and twisting to build their own obstacle course. This afternoon, Year 2 built their own boats following their plans. They were so excited to see whether their predictions were accurate and whether their boat did indeed float or sink. In Topic this week Jupiter Class followed their designs carefully to create their own illuminated letters. The children chose whether to use pencils, pens or pastels and all used sketches beforehand to create their final piece. I hope you have a great half term holiday! We’ve had another busy week in Jupiter Class this week. Year 2 started the week by completing some English and Maths assessments to help practise the skills learnt in class. They all did a wonderful job and I was very impressed with how hard they all tried! In English, Year 3 started the week by creating a story map for one of the other adventures that Professor Brownstone talks about in Arthur and the Golden Rope. The children had to choose whether to create a storyboard and write a narrative on Eleanor Brownstone’s great discovery of the crystal kingdom or Eric Brownstone’s epic battle with the hundred-headed snake king. Year 3 came up with some fantastic ideas and they were extremely imaginative and descriptive. Both Year 2 and Year 3 recognised adverbs within their writing this week and they practised writing them in context to describe Arthur and the monstrous wolves actions. In exciting writing, the children became journalists, writing an article for the local Icelandic newspaper. They wrote factual sentences and gripped the reader by using adventurous vocabulary! In Maths, Year3 have continued to work with fractions. They started the week by adding and subtracting fractions with the same denominator, before moving onto practising their expanded methods for both addition and subtraction. Year 2 have also been focusing on their addition and subtraction skills but through real life problems. We finished our Maths session today with our weekly times table challenge and it was wonderful to see such improvements in so many children. In Science this week Year 3 investigated the force of different magnets (ring, horseshoe and bar). Following on from our research session last week, the children had the opportunity to be ‘hands on’ with the magnets, sorting materials into magnetic and non-magnetic piles. Once they had a deeper understanding of the magnetic force and the different strengths each magnet had, they then predicted and carried out their own investigation. They had to see how many paperclips each magnet would hold, therefore demonstrating which magnet had the greatest force! Year 2 continued their work of Everyday Materials by proving why their planned boat was most suited for travelling across water. They all used the materials properties to convince Year 3 why theirs would be the best and I now have a shopping list full of materials that we need to collect in order to make these boats and carry out our investigation! This week, we have also recognised and celebrated two annual events, Safer Internet Day and Chinese New Year. The children created their own news round style videos to promote internet safety and showcase what they had learnt. We even learnt a chant which you may have heard at home already! ‘Before you tap and click, you need to stop and think and tell someone’. Today, we were lucky to take part in a whole school assembly about Chinese New Year lead by a member of the school community who has Chinese heritage. The children learnt about Chinese culture, the ways they celebrate New Year and the Chinese Zodiac calendar containing the 12-year cycle of animals. All of the class were interested to learn which animal signified the year of their birth. We had rabbits, dragons and tigers in Jupiter Class! In English this week Jupiter Class have continued to explore the fiction text ‘Arthur and the Golden Rope’. As one of the characters in the text (Atrix) is a storyteller, the children started the week identifying the difference between storytelling and reading. As a class they listened to Miss Connor retell the story the Norse myth ‘Sif and her golden hair’ using a story map. The children loved the illustrations and actions and were extremely enthusiastic about creating their own. Once they had finished their story maps, each pair performed their story to another using their drawings and key phrases to guide them. I was very impressed with the descriptive language that the children used and it was brilliant to see the impact on the quality of writing later on in the week. In Maths this week the children have continued to develop their understanding of fractions. They have been involved in practical activities finding fractions of quantities, compared and ordered fractions and found equivalent fractions. The children were impressed when they could find so many fractions that were the same as a half! In Science, Year 2 have used what they know about everyday materials and suitability to design their own boat that can carry a lego figure across water. They had to explain why their design was suitable using scientific vocabulary and many came to the conclusion that plastic would be the most appropriate because it is light, firm and waterproof. Year 3 had a scientific enquiry to investigate this week. Following on from our learning of forces, the children identified how magnets create force. They had to research what magnets are and how they create a force. The children had the option to present their findings how they wished and everyone chose to create a poster. As you can tell from the photographs, they are extremely informative and the children loved teaching the Year 2 children everything they had found out! In our Topic lessons, the children have investigated how archaeology has impacted on what we know about history. We researched Sutton Hoo and the children were fascinated to learn that it is an Anglo-Saxon ship burial from 620AD. They couldn’t believe that the site was excavated in 1939 and that it revealed some incredibly important artefacts which has helped us to understand Anglo-Saxons even better. They were extremely impressed to learn that buried with the ship were weapons, clothing, coins and valuable gold and silver. I think this information certainly made the history more real for the class as going back thousands of years is a tricky concept to grasp! If you want to find out more or the children wish to access more at home, the Espresso website is a fantastic resource for the children! The children have all been sent a letter home about accessing this. In Jupiter class this week we’ve had some great learning taking place! In English we have continued to explore Arthur and the golden rope. To start the week, the children identified how Professor Brownstone’s most cherished possession was a set of books. To highlight the value of books and reading in general, the children created their own poems using a repeated pattern to support their ideas. As we discovered that the main character Arthur was born in Iceland, the children used their research from their homework to write powerful, persuasive scripts which had to encourage tourists to visit Iceland - they were wonderful! In Maths, the children have started to explore fractions. We have created our own fraction museums, demonstrating what halves, quarters and various other fractions look like to us before moving onto fractions of given amounts and quantities. We have specifically focused on what fractions actually mean, understanding that it is equal parts of a whole and discussed the numerator and the denominator. Towards the end of the week, the children have become more confident in identifying the relationship of division and fractions and some children even managed to quantities of non-unit fractions such as 3/5 and 2/3. In Science this week, Year 2 have applied their knowledge of everyday materials to identify the suitability of materials for different objects. They used their knowledge of properties such as transparent, firm and waterproof to prove why certain materials are used and why. Year 3 have investigated fiction this week! They loved exploring the pushing force applied to objects and experimented how the amount of friction is dependent on different surfaces. In pairs the children completed their experiment using toy cars over different surfaces and measuring the average distance they traveled when a pushing force was applied. In Topic this week, the children have learnt about Anglo Saxon and Viking settlements. They explored what attracted the families to settle in certain locations and discussed the positive and negatives of each location/settlement. We have combined our Topic, English and Art lessons this week as we created our own version of the Northern Lights on Friday afternoon. The children were so impressed with how simple the technique was in relation to how effective it looked! Finally, on Wednesday, Jupiter class were also lucky enough to take part in a music workshop. Jupiter class learnt about rhythm and timing and had lots of fun learning to play syncopating samba style rhythms with a variety of instruments. In Maths, the children have continued to learn about measurement, particularly focussing on length and height. They have converted between the different units of measure through fluency and problem solving style questions and have thoroughly enjoyed the practical lessons. This involved measuring the length of sides in a range of 2D shapes, which linked nicely onto investigating the perimeter. While this was actually a Year 3 objective, the Year 2 children loved the challenge! In Science, Year 2 have continued to explore everyday materials. This week the children went outside to find objects made from the materials discussed and they had to prove they were correct using the properties of each material. They also recognised that a material can be used to make a number of objects and one object (like a car) can be made by numerous materials. This week Year 3 have explored what a force is in more detail. They have identified forces that need physical contact such as pushing, pulling and twisting and those which require no physical contact. Next week they will be exploring friction and how this can change due to different surfaces. In Topic, the children have enjoyed learning about the Anglo Saxons and the Vikings. Once they had identified what they wanted to find out during the next term, the children explored the timeline of events from over 2000 years ago. The children were interested to know that the Anglo- Saxons invaded before the Vikings and whilst both invaded Britain because they wanted land, their beliefs were very different. This afternoon, we finished the week off nicely with a PE session which focussed on improving our throwing and catching skills but also our ability to work well in a team. Some children forgot their PE today so please can these be in school on a Monday ready for the week. Jupiter Class have had a busy first week back after the Christmas holidays! After returning to school on Wednesday from their Grafham Water trip, the children have jumped straight back into their learning! In Maths we have explored measurement, with a particularly focus on measuring lengths and height. The children have learnt about the different units of measure and have worked hard, using their skills to convert between them. In English, we have started to explore the mythical text ‘Arthur and the Golden Rope’. The children have predicted what they think the story will be about and they have written expanded noun phrases to describe the objects inside Mr Brownstone’s secret family vault! I was very impressed with how some children managed to include fronted adverbials and similes in their writing! In Topic this week we introduced the Vikings and Anglo Saxons. The children were very excited to learn about the past and they all came up with some fantastic questions. Hopefully, we will answer all these as we learn more about the Vikings and Anglo Saxons! In Science, whilst Year 2 have started to explore everyday materials, Year 3 identified what they knew and wanted to know about forces and magnets. The children already know lots about their scientific areas, which gives us a great foundation to build on. Jupiter class loved creating their Roman shields today and baking Roman flatbread! It was a great way to end our topic this term! The final full week in Jupiter Class (before we break up next Wednesday for Christmas) has been full of festivities! While we have been super busy with the Nativity and I must say I was so pleased with everyone! Whilst Year 3 did a fantastic of supporting in the choir, Year 2 were the stars of the show! They truly did themselves proud and were absolutely wonderful with all their acting and singing, well done! However, aside from the Christmas fun, we have managed to continue our fantastic learning in all subjects. In English, the children have continued their learning of non-fiction texts by creating their own books on polar bears. The children have loved creating these as they have tried to work independently researching information, finding and selecting appropriate images and editing their work so it is publisher worthy. In Science, Year 2 have continued their living of habitats. We have specifically focused on a Polar bear’s habitat as this has linked in nicely with our writing in English. The children identified the features of the Arctic environment, stated why it is suitable for animals that live there and explored what is meant by the word ‘dependency’. Year 2 learnt that all living organisms depend on one another to survive. This led us on to our conversation of food chains and what it means to be a producer, consumer, omnivore, carnivore or herbivore. Year 3 have brought their topic of light to a close this week by identifying how shadows change shape depending on various factors like the position of the light source. They also used this week to reflect on what they have learnt this half term and it was a great opportunity to observe just how much learning has taken place in Jupiter Class. In Topic, the children were excited to see their Roman coins after they had been fired in the kiln! These will be sent home next week and the children will be making Roman shields to finish our Topic off nicely! The Christmas festivities have definitely started for Jupiter Class this week but we have also been learning lots! In English this week we have started to explore non-fiction texts in preparation for writing our own next week. We have identified the features of non-fiction books and compared them to fiction.We have learnt about how to locate information using the index and have specially focused on facts about polar bears as the children will be basing their books around this special, Arctic mammal. The children enjoyed learning about polar bears and some were fascinated to learn that they can hold their breath underwater for 2 minutes! In Maths, Jupiter class have been applying their multiplication skills into problem solving activities. Whilst Year 2 have specially focused on the 10, 5 and 2 times table, Year 3 have continued to develop their understanding of the 3, 4 and 8 times tables and some of us have also been working with multiplying a 2 digit number by a 1 digit number. I was very impressed to see the children using their place value knowledge to partition the number up to make the answer easier to work out. We have continued to demonstrate our mathematical understanding through visual representations to address misconceptions, but also to prove our theories and answers are correct. In science this week, Year 3 have continued to learn about light with a focus on shadows. They started by exploring the different opaque, transparent and translucent materials before successfully recognising that opaque objects (like us!) create the best shadows as no light can pass through them. After their investigations, the children demonstrated their understanding by presenting their own scientific shadow puppet show! Year 3 did such a great job of highlighting what they have learnt and year 2 couldn’t believe that light travels in a straight line and that the moon isn’t actually a light source! In Year 2’s Science lesson we have identified the difference between micro -habitats and world habitats. This week we had a specific focus on world habitats and the children played a game in small groups to demonstrate their knowledge and understanding. One by one they had to pick up an animal card and determine where that animal’s habitat is. We had great discussions about unfamiliar animals and we spoke about how animals depend on one another in order to survive. This also links brilliantly with our English focus as we have already been discussing a polar bears habitat. I look forward to seeing many of you at the Christmas fayre tomorrow. In Jupiter this week we have been busy completing our assessments. The children have tried their best and I have been super proud of their resilient attitude. Luckily, we finished our assessments and continued our learning in Maths, English and Science. In English, the children have become real-life storytellers and adapted the familiar story of ‘The Princess and the White Bear King’. First they planned their stories in pairs before writing their own versions. I thoroughly enjoyed listening to the children’s ideas and was so impressed with their huge imaginations. In Maths, Jupiter Class have continued to explore and learn about division. They have solved practical problems using visual representations and proved their answers were correct using the inverse of multiplication. Whilst Year 2 have been practising their Christmas performance, Year 3 continued to learn about light. This week they explored the benefits and dangers of UV light from the sun. They identified statements which were ‘hero’ and ‘villain’ and they then used their knowledge to design their own protective hat or glasses. The children thoroughly enjoyed creating posters to advertise their fantastic designs and many gave their products a 5 star UV rating. 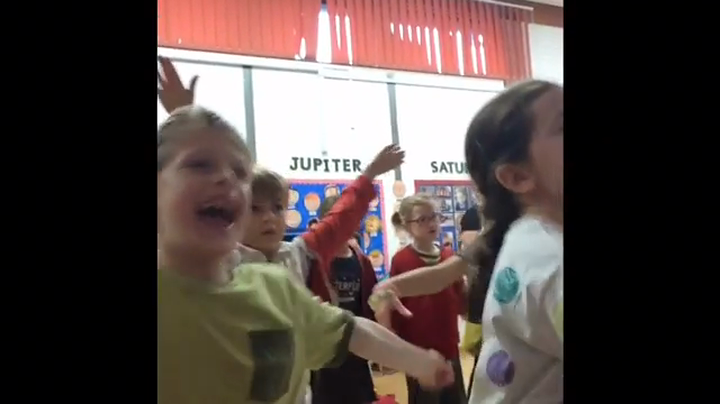 This week has flown by for all of us in Jupiter Class, we cannot believe it’s Friday already! In English, we continued to explore the fiction text, ‘The Princess and the White Bear King’. We started the week by sketching a key setting in the story and the children used a range of interesting adjectives to the describe their setting. We discussed new vocabulary such as ‘idyllic’ and the children used their adjectives to form a description of the setting. Myself and Mrs Passan were so impressed with the children’s use of similes and their wonderful noun phrases. It certainly demonstrated how well they all have understood the text! In Maths, we have continued to learn about multiplication and division. We started the week by writing mathematical statements involving both concepts to highlight the relationship between the two. Then, we moved onto grouping on a number line to work out the answer to a range of division questions – some of us managed to move onto division questions with remainders! We have also explored doubling and halving this week by using our own machine. The children had given numbers already inserted and they had to figure out the numbers given back out. It was a great challenge that really got our brains thinking! In Science, following on from their homework tasks last week, Year 2 identified local habitats and Year 3 explored a range of suitable and unsuitable materials for reflection. Year 2 thoroughly enjoyed going outside into the outdoor learning environment and identifying different animals that could live there. Year 3 explored a range of suitable and unsuitable materials for reflection this week. Using a torch as a reflector, they had to shine the light onto each material to test which was the most reflective. All of the children made predictions before their experiment and they were pleased to find that they were correct – both the mirror and yellow card reflected the most light. In Topic this week the children were so excited to create their Roman coins using clay. Following their designs from last week, the children carefully rolled, moulded and sculpted their coins to match their intricate plans. The children did a great job of including finer details of names and numbers and I am looking forward to seeing how they look after being fired in the kiln. In Jupiter Class this week we have been super busy as usual! In Maths, we started to explore multiplication. We shared our understandings of multiplying numbers and all children recognised multiplication as repeated addition. The children used concrete resources and pictorial representations to answer multiplication questions and I know Mrs Hampson was very impressed when she saw our learning on Tuesday. I have been really proud of how well Jupiter have grasped the range of vocabulary used for multiplication and this has definitely helped them when answering questions as they have continually asked themselves “How many groups have I got?” This will also come in really handy when we begin to focus more on division next week and inverse relationships. In English, the children are still thoroughly enjoying the book ‘The Princess and the White Bear King’. This week they described the bear’s castle using adventurous vocabulary and new words identified in the book. The children learnt what the author meant by ‘tapestries’ and some even managed to include similes in their writing. As it was politics week this week, we thought it would be a good opportunity to link it to our learning in English. The children split into group of 5 to decide whether they agreed or disagreed with the Princesses mothers’ advice. This was a great opportunity to recognise that it is ok for people to have different opinions! In Science, Year 3 investigated what we mean by light and dark. They were sure that you could see in the dark so we carried out our own investigation. Individually, and in pairs, the children volunteered to step inside the cupboard when no light source could illuminate the objects. The children soon realised that we do need light in order to see and you can see from our photographs that they thoroughly enjoyed their scientific enquiry. Year 2 have continued to learn about animals and their habitats, they explored the concept of living, dead and non-living and sorted different images to highlight their understanding. In Topic this week we have designed our own Roman Coins ready to make next week. We started by researching and extracting information about three Roman emperors, Hadrian, Caeser and Augustus. From this, each child chose one emperor to base their design on and they included key symbols to represent their chosen emperor. Some children who selected Julius Caesar decided to include numbers to highlight his invention of the calendar. Today the children loved all the activities carried out to raise money for Children in Need. They had so much fun in the hall for the sponsored dance off and it was a wonderful opportunity to help children who aren’t as fortunate as them. Children in need sponsored dance off! We’ve had a great second week back after half term. In Maths, we have continued with addition and subtraction before moving onto multiplication next week. Whilst Year 3 started the week by adding numbers using the expanded column method, Year 2 demonstrated their understanding of fact families below 100. On Thursday, the children got to use their addition/subtraction and apply them when handling money. The children thoroughly enjoyed solving real life problems! Some purchased items from the tuck shop using the coins given, whilst others had to plan a birthday party using a shopping list and a budget of £25! In English, we have continued to explore the fiction text ‘The princess and the white bear king’. The children have enjoyed the story so far and all have made some fantastic inferences on the basis of what has been read. The children have used adventurous vocabulary to describe the princess and they have then justified their reasons using evidence from the text. It has been wonderful to see how much they have learnt about the characters and this has shown when they each took on the role of the princess to write a diary entry. In Science this week we have identified our new focus for this half term. Whilst Year 2 are developing an understanding of living things and their habitats, Year 3 have moved onto investigating light. This week, it was a great opportunity to identify what we already know about these topics and what we would like to know by the end of the term. The children came up with some fantastic facts from prior learning and all had at least two questions that they have set out to answer! These have been placed on our Science working wall so the children can answer them as we continue to learn over the coming weeks. Jupiter class thoroughly enjoyed their Diwali morning on Tuesday! As you saw from Mrs Bullimore’s post, the children worked extremely hard to create their own Rangoli patterns. I was so impressed with their perseverance and intricate designs . Today, we spent the morning learning about Remembrance Day. We shared a class story about the soldiers who fought for our country and discussed why poppies are a symbol of remembrance. The children then had the opportunity to remember the soldiers through creating their own fields of poppies. I was very impressed with the care that went into each painting and know they will look wonderful displayed as a symbol of remembrance, 100 years after the First World War ended. This afternoon we were very lucky to have our first gymnastics lesson with Miss Leighton (Hunts SSP coach). The children explored ‘point’ and ‘patch’ positions which they then used within a sequence. It was great to see them working independently and in pairs! Jupiter Class have had a great week back after half term. After our training day on Monday, everybody came back ready and eager for the lead up to Christmas! Following on from our English focus of traditional tales before the half term break, the children this week have been introduced to the fiction text, ‘The Princess and the White Bear King’. On Tuesday they identified props within a story bag and had to predict what they thought the story might be about. Once they read the opening, the children recognised that the Princess was desperate for a crown so they had to design their own and write a letter to the King persuading him to choose their crown for his daughter. In Maths, the children have continued to practise and refine their addition and subtraction skills. They have all used their place value knowledge to partition numbers accurately into hundreds, tens and ones in order to make the process of adding and subtracting easier.This week we also identified what we know about the inverse. It was a great opportunity for the children to see the link between addition and subtraction and to solve some missing number problems! In Topic, we are continuing to learn about the Romans and Jupiter Class thoroughly enjoyed learning about the historical figure Boudicca this week. In pairs, the children used fact files to research and extract information about the British Celtic queen. They answered questions about Boudicca and many were surprised to learn that somebody actually rebelled against the powerful Romans! 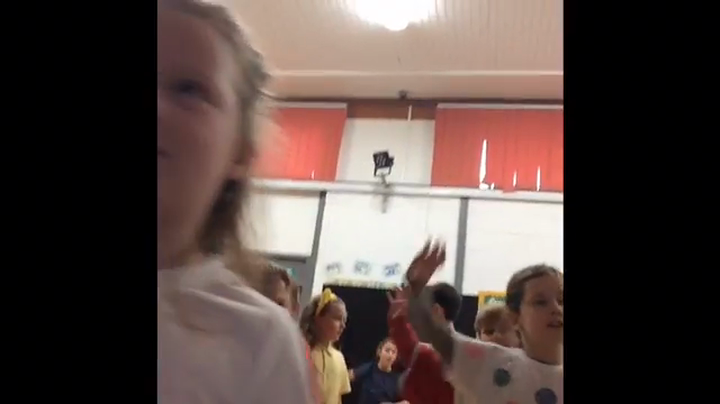 In Music, the children have been exploring accompaniments to myths and joining in with the melodies and chants using their voices and body percussion (clapping etc.) This week, they have moved onto exploring instruments and selecting ones to accompany the various melodies and chants they have been learning. They will then go on to perform these in small groups. Following on from Mrs Bullimore’s message yesterday, I am thrilled to say that Year 3 came 1st at the DLPT sports event along with the children at KPA. Yes, it is wonderful to come back as winners however, I am so proud of how the children behaved. Not only did they join up and work as a team with children they didn’t know but they battled through some challenging weather too. Well done Year 3, you represented Great Staughton brilliantly and behaved impeccably. Despite being super tired this week, Jupiter Class have worked extremely hard and tried their best! In Maths, we have been using our addition and subtraction skills to solve missing number problems. It was a great chance for the children to demonstrate their understanding of using the inverse too! Whilst Year 3 learnt how to add 3-digit numbers using the expanded column method, Year 2 used concrete resources, such as a number line, to add three 1-digit numbers together. We also discussed how using our knowledge of number bonds can make this easier too! In English, the children have continued to explore fairy tales but with a twist! Initially, they created a storyboard for their fractured tale, which gave them a clear plan when writing. As a class we discussed what an introduction must include and all the children were able to use the vocabulary researched last week to support them in their fractured fairy tales. The children were extremely imaginative and I was very impressed with the interesting adjectives and direct speech they used. After identifying food as a basic need for human survival last week, this week Jupiter Class investigated what a balanced diet consists of and what it actually means to be ‘balanced’. The children learnt about the 5 different food groups and the nutrients they provide us with. They were all surprised to learn that 33% of our plate should be fruit and vegetables so you never know parents, they may start eating more at home! We’ve had another super busy week in Jupiter Class! In English, we started the week by exploring the fiction text ‘Use your imagination’. The children shared their opinions of the text and then worked in small groups to predict and write their own endings. The children have identified the magical ingredients needed for writing a fairy tale by identifying story starters, listing key characters and recognising the importance of a setting. This has been great preparation for when the children create their own fractured fairy tales next week! In Maths the children have continued to use their knowledge of place value to add and subtract numbers correctly. As a class we have identified the importance of partitioning a number into its tens and ones to help us when both adding and subtracting and the children have thoroughly enjoyed using resources such as the giant number lines to help them. Jupiter class have also used their Maths Jotters to support them in solving mathematical problems this week. They have enjoyed jotting down notes and using pictorial representations to help visualise the numbers they are trying to add to and subtract from. In Science we have continued to learn about animals, including humans and both year 2 and year 3 developed their understanding the needs for survival. Whilst year 2 highlighted the five needs and described why they are essential for humans to survive, year 3 went into further detail by exploring how the circulatory system works successfully by making sure that the nutrients and oxygen in our blood is transported around our body. In Topic, the children have enjoyed designing and creating their own Roman mosaics this week. To begin with, they viewed a mosaic gallery to develop a better understanding and many children were surprised to learn that this type of artwork demonstrated wealth and power in the Roman times. The children made their own mosaics using small square stickers to represent the tiny tiles used all those years ago. I was extremely impressed with the children’s designs and finished pieces of art. They were all extremely careful with their work and some of them were very intricate. They are going to look wonderful above our Roman display in Jupiter class. We’ve had another great week in Jupiter Class. Today, we finished the week off with a busy morning celebrating National Poetry Day and a fantastic PE lesson, focusing on our throwing and catching skills. In Maths, this week we have begun exploring addition and subtraction. We have used our knowledge of place value to help us partition numbers to make adding and subtracting easier and we have practised our number bonds to 10, 100 and 1000. We have had lots of discussions about similar digits and how we can use known mathematical facts to help us answer trickier questions. In English, we have created our own set of instructions for how to escape from Pompeii should Mount Vesuvius erupt. At first, the children explored a set of instructions for brushing their teeth and they then created a compulsory checklist which listed the essential parts for writing instructions. This meant that when the children came to write their own instructions on Tuesday, they knew exactly what to include. The children also became reporters this week as they wrote a newspaper report stating the tragedy in Pompeii on the 24th August 79 AD. They loved going back in time to write the report and it was a great chance for them to write in a different style. In Science, both Year 2 and Year 3 have continued to learn about Animals, including humans. This week, Mrs Tickle joined us for our Science lesson and she was extremely impressed with how much we knew about an animal’s body. On Monday, we took our learning outside and the children worked in groups to identify different parts of the body. Whilst Year 2 identified organs and their functions, Year 3 identified the different organs, bones and muscles that our bodies have. Next week, the children will develop this further by exploring what our bodies need in order to survive. In our Topic lesson this week, the children discussed and developed their understanding of Roman inventions. They identified in groups what they knew the Romans had invented and then selected another invention to research and investigate. The children were fascinated to learn how much impact the Romans have had on our lives and the enormous legacy they’ve left behind! Thank you for another fantastic week Jupiter Class.